Demonstrators damage a Dominican Republic’s flag during a protest in Port-au-Prince, Friday, May 8, 2009. 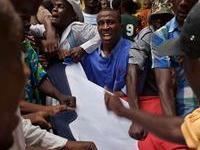 People hurled stones and tore down a sign at the Dominican Republic’s consulate in Haiti to protest the decapitation slaying of a Haitian in Santo Domingo. In America, Mexicans are the bottom of the food chain. Whether native born or not, they are treated like illegal aliens, reminded time after time again and again that they’re taking away our jobs even when the only reason some of those jobs are available to them is that no self-respecting American is willing to do them. People try to pretend this hate of ALL Mexicans stems from the fact that some Mexicans are breaking the law to live here in America. But under all this is a thinly veiled contempt for all brown people. In a word, it’s disgusting. In the Dominican Republic, Haitians are the bottom of the food chain. Whether native born or not, they are treated like illegal aliens, reminded time after time again and again that they’re taking taking away jobs…okay, so you get the drill? Not to mention that there’s always been a lot of bad blood between Haiti and the Dominican Republic. Haiti took over DR once (or was it twice?) And it doesn’t help that DR’s own personal evil dictator, Trujillo once enacted his own personal genocide against Haitians in the Dominican Republic. He then calmly told Jews escaping the Holocaust that they should pack their bags and come right in. If you’re a dark-skinned black in the Dominican Republic, the backhanded joke people make is that you look like a Haitian. This is not a compliment. And no self-respecting Dominican owns up to the fact that they probably have some Haitian blood. Only Spanish blood is glorified after all. In a word, it’s disgusting. In this kind of climate, it’s easy to see how things could get ugly real fast. And they did. According to Dominican Today and Latina magazine, a Haitian man, Carlos Nerilus was lynched and beheaded by an angry mob. This happened in a country just off the coast of Florida, off the coast of a country where a black president rules the roost. The crime was retribution against the Haitian national who had allegedly stabbed to death of his Dominican employer on the previous day. Either way, I’m glad to live in a country where this kind of stuff no longer happens to black people. As a rule, Americans don’t seem inclined to lynch and kill random black people or for that matter, suspected criminals. But there is plenty of news since Obama that reminds us that racially motivated attacks against Latinos are not all too infrequent occurrences. I’d say it depends on where in America. Some midwestern place infested with Saxons and Scots-Irish, yes, though some parts of Texas not so much, while other areas of Texas definitely. I think some Central Americans are below Mexicans on the food chain as Mexico has strict border laws with Guatamela and Belize. Of course in New Orleans, most of the Latino population (excluding Islenos and old Spanish families) is central American, and mostly suburban, middle to upper-class, Republican (at least pre-Bush), and only a quarter or so knew Spanish. I believe that being black is the worst thing you could possible be in this world.Period. For instance, the original Jews (eg. moshe, yosef) were not white like the Ashkenazic Jews today. They were dark-skinned people with semitic features who became white in Europe by marrrying white converts. Dominicans pursue the same goal, marry a white or light-skinned person to delete the dark shadow from their bodies. It’s rare to see biracial couples in the muslim world as well. When you look at all these actors from spanish soap operas, you dont see any black actor or actress as the protagonist. Ever. Racism is not limited to NY or Chicago. It’s everywhere unfortunately. People are never going to change. I am sorry but that’s the reality. Personally, I think children from a biracial couple are more beutiful than those from the same race. G-d wants us to mix and not to live isolation from others. Look what happened to the people who built the tower of Babel. People in general are blinded by their stupid views of a perfect world that does not exist and that’s why we suffer so much because none of us tries to fix the problems of the world we never learn from our mistakes or from the lessons that can be found in our Torah. Moshiach will never come unless we Jews do something about it. I dont think we deserve him quite honestly (wait for the mailman rather,he will come faster than our J moshiach) Look at the chosen people nowdays and the racism that presently lives in our circles. Orthodox Judaism is in exile. Rabbis are losing their minds making conversion to our religion impossible because they’re afraid that people of color will take over the religion. They wont let a black convert marry their beutiful Jewish princess, they rather have her marry a white non-jew than a black Jew. If you look at Jewish publications, Jewish press or magazines, can you find a story about black jews and their contributions to the Jewish community? No, Can you find advertisements of black Jewish kids or teens in the papers? No Can you find illustrations of black kids in children’s book? rarely. I am telling you guys racism is killing both the Jewish world and the gentile world. You see no progress whatsoever. None. I’ve seen it and lived it you guys. We need to change and improve our ways. Sometimes I feel that Hashem is in the galut as well. Let’s bring him home. Let’s do it now. Wow, Dan, that was heavy. Thanks for sharing.